North West-based Global Material Handling has secured its biggest deal yet after signing a seven year, 33 truck contract with the Rowlinson Group. 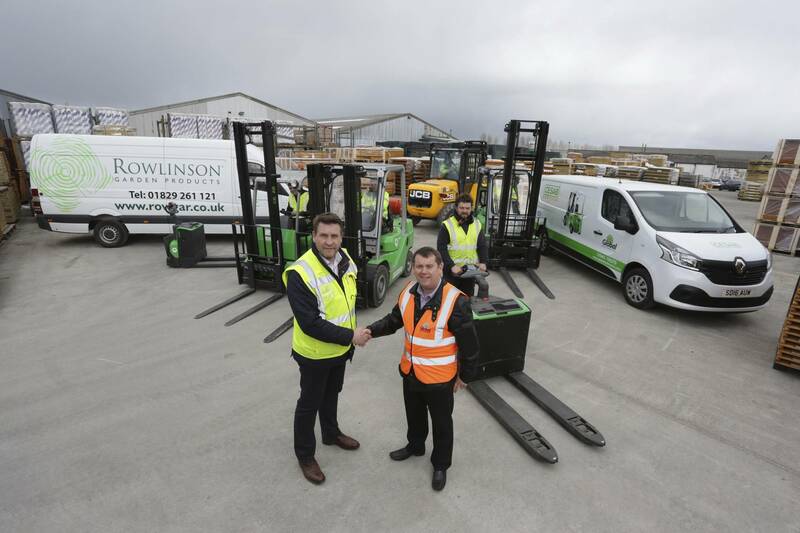 The St Helen’s forklift dealership will be supplying Cesab products, service and support to group companies Rowlinson Garden Products and Rowlinson Packaging in Nantwich, Cheshire. The 33-strong fleet across the sites includes Cesab M300 4-wheel counterbalance forklifts in LPG and diesel, Cesab B215 electric three wheel forklifts and Cesab P200 powered pallet trucks. A family business trading in timber since 1926, Rowlinson Packaging is a leading UK supplier of wooden cases and wooden pallets, employing nearly 200 employees across two sites and servicing some of the UK and Europe’s largest manufacturing exporters. Rowlinson Garden Products is one of the UK’s leading manufacturers and distributors of garden products, supplying garden structures, outdoor storage solutions, garden furniture and accessories from its premises in Wardle, Nantwich. High service levels, quality products and strong relationships are among the reasons the Rowlinson Group has chosen Global Material Handling.